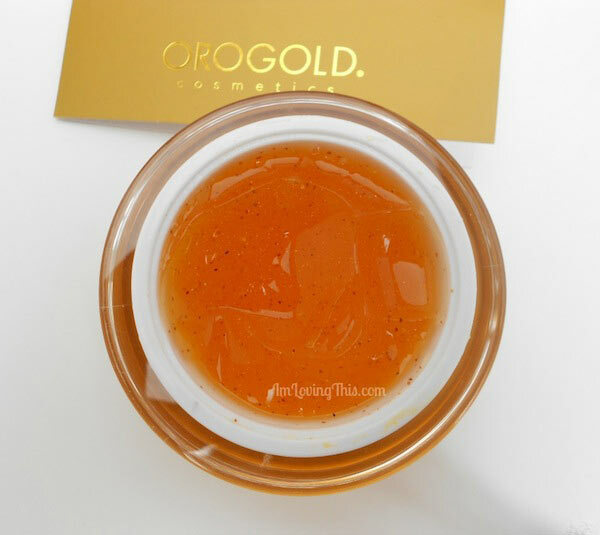 My boyfriend brought me back the Orogold Cosmetics 24K Deep Peeling Gel back from Hawaii and I have been meaning to review it for quite some time. The Orogold 24K Deep Peeling provides a powerful facial cleanse by removing a thin layer of dry cells to reveal ultra-smooth and youthful skin. It is specially formulated to gently polish, renew, and revitalize the skin without stripping away vital oils or causing irritation. The 24K Deep Peeling is formulated with 24K Gold, Ascorbic Acid (Vitamin C), Tocopheryl Acetate (Vitamin E) and Green Tea. The directions say to wash your face and add a small amount of the product to your face, avoiding the eye area and then rub the peel in a circular motion. They say not to leave the product on for more than 30 seconds. Rinse your face with cool water to remove any product and use weekly. The Orogold 24K Deep Peeling is quite expensive and it is definitely something that I wouldn’t just randomly purchase on my own. It is listed for $128 for 50 ml on their website, although I’m not sure what my boyfriend paid in the actual store. The container comes laying in a satin type material inside of a white box with gold writing on it. It looks very luxurious and is what I’d expect to receive after paying over $100 for a product. The actual peel comes inside of a Gold container shaped like a ball. I like the packaging and it is very sturdy and can hold up to traveling. The 24K Deep Peeling has a slight unpleasant smell to it, I can’t really explain it. The smell is bearable, I don’t really notice it when applying it to my face. Fragrance plays a huge part in if I like a product or not and this fragrance didn’t turn me off from the product at all if that helps you in any way. The gel is a gold colour and has gold flakes throughout it. It also has some black/brown flecks throughout it, not sure exactly what those are, maybe the green tea? When I use this product I take a small amount and quickly, but gently rub it around on my face for less than 30 seconds. Instantly I will see my dead skin balling up, at least I think that’s what I think it is. The more often I use the product the less dead skin I see ball up. I do find it hard to rinse off areas of my face, maybe I’m not doing it quick enough? It tends to ball up and get stuck anywhere I have a bit of peach fuzz. But I really don’t mind, the end result is worth it. The Orogold 24K Deep Peeling gel leaves my skin feeling and looking smooth instantly after using it. My face feels like a baby’s bottom every time I use it. It leaves my face looking fresh and brightened as well, probably because it removes all the dead skin cells. I don’t use the Orogold often because it is really expensive so I will never see the full results of using it weekly. But even just using it every few weeks it has helped improve my skins overall appearance. I have never used another product at home that actually takes a layer of dead skin off my face. It is really neat to see the skin ball up. I would love to find something less expensive that gives me the same results. But it’s still cheaper then going to a beauty salon. Like I said earlier, there is 50 ml of product in the container. It doesn’t look like that much but it does last quite some time, you don’t need much. I should also mention that the product doesn’t dry up. Sometimes masks and gels will harden and become useless. This one doesn’t and I’ve had it for along time now. I read a lot of poor reviews online about this product when I first received it. Most people were complaining about being pushed into buying this product. That does not give consumers an accurate review of the actual product. Everyone has a choice to purchase something, and that is a decision we all have to make ourselves. People shouldn’t blame someone else for their poor spending habits. I doubt that the sales associates pulled out their credit card and made them purchase this product. Rant over. It just really bothered me when reading the reviews. I do recommend this product, if you can afford the splurge. I will be looking for it at a discount when my container of Orogold 24K Deep Peeling runs out. P.S. Orogold just contacted me after I posted this blog post and wanted me to share a promotion with you that they are running until October 13th, 2014. Receive 20% off at select store locations and on their website using promo code OGFALL20.